FTD is pleased to announce the release of “ELVIS: ST. PAUL to WITCHITA - OCTOBER ‘74”. 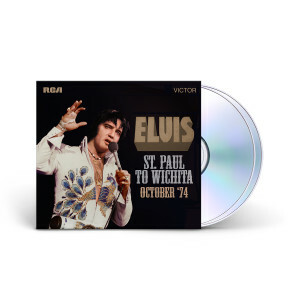 Released as a 5” digipack, and taken from the original soundboard source, this 2-CD set features Elvis in excellent form from the fall tour of 1974. Elvis was in great form and using a variety of repertoire. Disc 1 recorded at Civic Center, St. Paul, Minnesota. October 2, 1974. Disc 2 recorded at Henry Levitt Arena, Wichita State University, Wichita, Kansas. October 7, 1974.